Decalcified compact bone looks completely different than compact bone that still has calcium salts in its matrix. The arrangement of cells and matrix is not as obvious, and it is stained with the same blue and pink that you have seen in most of the other images. In this image the bar indicates the location of decalcified compact bone. 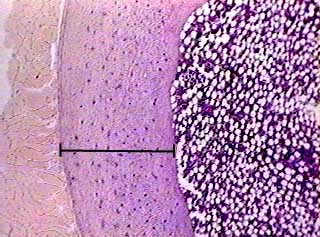 This slide contained a cross section of a very small bone, and you are looking at the entire thickness of the shaft of the bone. To the left is muscle tissue, and to the right is bone marrow. In the compact decalcified bone (cb) on the left part of the image, you can see small dots, which are lacunae containing osteocytes, and larger light dots, which are spaces containing blood vessels. 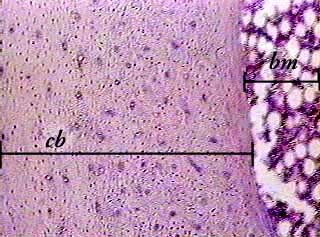 The bone marrow on the far right of the image is actively making blood cells. If it were inactive, all you would see there is adipose tissue. You should be able to recognize osteons in the right half of the bone tissue. 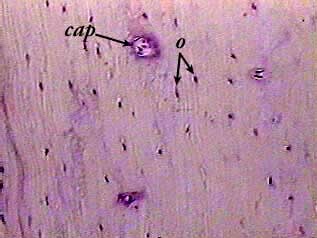 Osteocytes (o) in lacunae show up as dark spots. Sometimes you can see a sliver of white space around the osteocytes. The larger open areas in the bone are canals carrying capillaries (cap) and nerves. This is an enlargement from the left side of the image above. The compact bone tissue on the outside of a bone is often made in layers (circumferential lamellae) that extend around the bone instead of being part of an osteon. Tissue from the outside of a bone is more difficult to recognize because you can't see the osteons.